The Vet Life is headed to Houston. This week, Animal Planet announced the TV show’s third season will debut in January. The new season will follow Houston area-based vets as they struggle with the effects of Hurricane Harvey. Season three of The Vet Life premieres on Animal Planet on January 13th at 10 p.m. ET/PT. 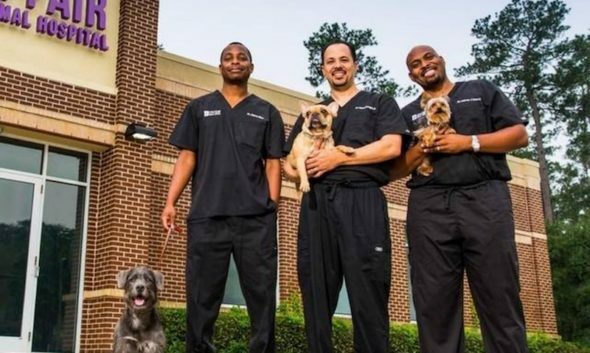 With their Houston area-based veterinary practice flourishing, Dr. Diarra Blue, Dr. Aubrey Ross and Dr. Michael Lavigne are eager to continue serving their loyal clientele including loving family cats and dogs as well as farm and other animals. This season, as the Doctors simultaneously balance their work and personal lives with wives and kids, they must also support one another more than ever before as unexpected events challenge and inspire them. The third season of THE VET LIFE premieres Saturday, January 13 at 10 P.M. ET/PT. The season premiere of THE VET LIFE follows the Cy-Fair Animal Hospital reopening after being closed due to Hurricane Harvey. While the vets work around the clock to save animals and aid family and staff that have lost everything, Hurricane Harvey hits close to home for Dr. Blue when it directly affects his family. Other stories this season include Dr. Blue traveling to a Vegan cattle ranch to stop an unexpected cow baby boom, Dr. Ross dealing with a trio of mischievous ferrets with a skin condition, and Dr. Lavigne performing a knee surgery on an old English bulldog after the dog’s rescue from a puppy mill. With work keeping the doctors busier than ever this season, each must find the work/life balance that works best for them as they make the time for monumental life events, such as Dr. Blue’s fifth wedding anniversary renewal in Las Vegas, giving their kids driving lessons, and exciting family camping trips. What do you think? Do you watch The Vet Life? Will you watch the new season? I like ‘The Vet Life ‘. I am awaiting season 4. Please do not cancel this show. I love the antics of the Docs and their expertise. They are a loving family and it shows in their actions. Please do not cancel. please dont cacel this show! this is the best show ever! they are such a family orientented based group. instilling love and down to earth god based as a total group. they have sunday supper ever week and i know this is why and how they work so well. they believe in family and each other! those who stick together stay together!!!! I absolutely love “The Vet Life”, & hope & pray that the show has been renewed for another season! Love the interaction of the three vets & their families. We need more shows like this! The Vet Life is an awesome show. Hanging With the Hendersons is boring and nowhere near the same quality. Pleas do not cancel The Vet Life. Please don’t cancel the Vets!!! I really enjoy the show! Wonderful family show! Please renew!